It's only been 18 days since I took off to Thailand for my yoga retreat with One Love Yoga, but it honestly feels like it's been a month. The difference in culture opened my eyes up to a whole other world I had no clue existed, and it's official: I now definitely, definitely have the world travel bug. We started our retreat in Bangkok, and stayed in a hostel off the infamous Khao San Road. Filled with shops, restaurants and street vendors, Khao San is a backpacker's dream. You can find everything from handcrafts, jewelry, fried insects, pirated DVD's and knock-off Ray Bans by the thousands. 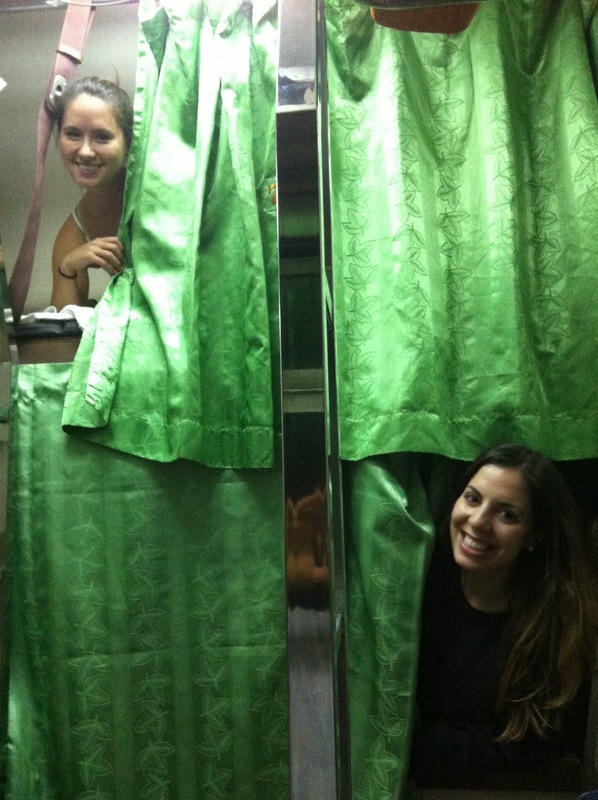 From Bangkok, we hopped on an overnight train and headed down south, island-bound to Surat Thani. A definite 13-hour long experience with the "bathroom" of my nightmares... should you ever hop on this night train, just remember to bring your own toilet paper. At the ferry port. Ocean, finally! After planes and night trains, taxis and ferry rides, we FINALLY arrived in Koh Phangan. Crystal blue water and hot sun felt like heaven. My favourite resto on Haad Yuan beach. Amazing fresh fruit shakes and Thai dishes! To get back and forth from Haad Rin to Haad Yuan beach on Koh Phangan, we had to hop in one of these longboats. Basically, a guy with a propeller on a stick got us where we needed to go. So we decided to spoil ourselves and booked a room at the Best Western Phanganburi Resort in Haad Rin for two nights. It's a beautiful resort about a 10-15 minute walk away from the hustle, bustle and partygoers "downtown" Haad Rin. Our first night in Haad Rin, we decided to go to the half moon party. 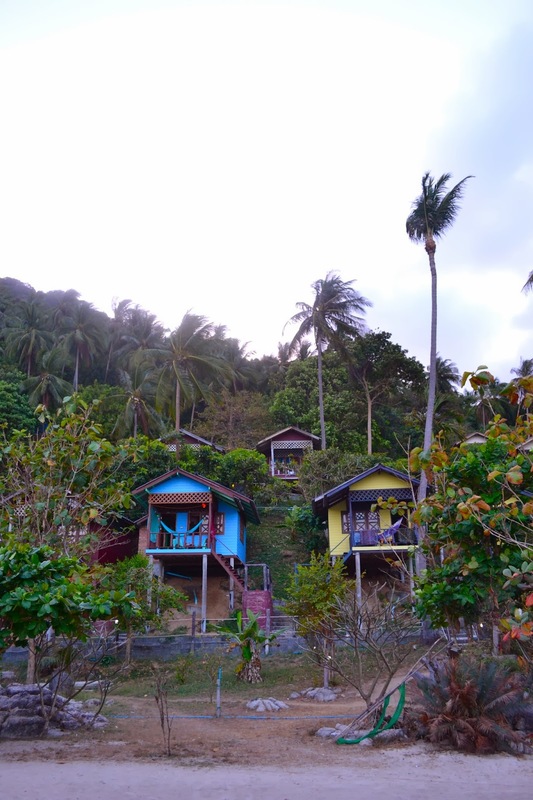 Unlike the wild full moon party on Haad Rin beach, the half moon party is located up in the jungle. The party starts late and continues through the night until around 7AM. Nuts! After our yoga retreat ended, Pam and I headed over to breathtaking Koh Phi Phi for a few days. 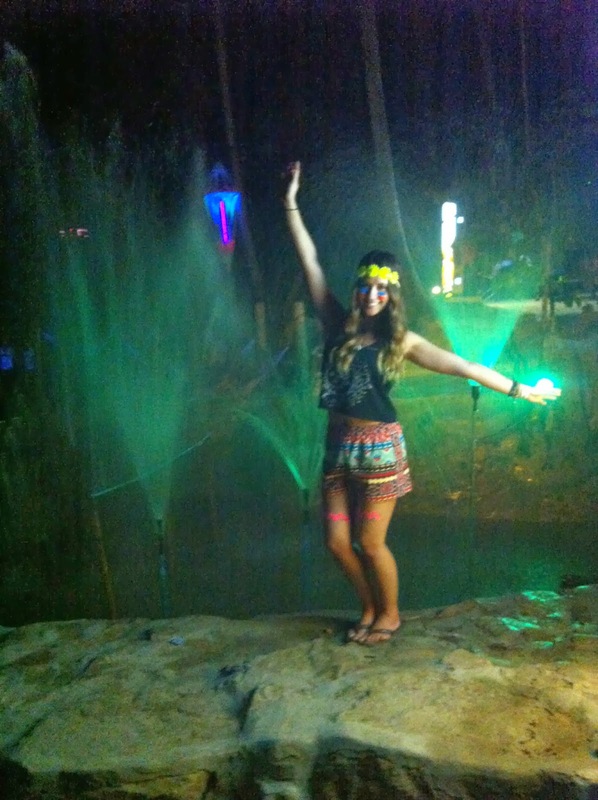 Definitely more tourist-y than Koh Phangan, Koh Phi Phi was party central at night, but still so beautiful. On our second day in Koh Phi Phi, we decided to take a boat tour over to Maya Bay, Maya Beach (where The Beach movie was filmed), and Monkey Beach. This was my absolute favourite day on my whole trip (despite getting slapped by a wild monkey who tried to go through my purse looking for food... ha). So if you can't tell already, I had the absolute best time. I've been home for just over a day and I'm already starting a plan on how to head back to Thailand ASAP. Our trip was filled with hilarious memories with everything from a gecko that kept us up every night, a painful Thai massage experience, Muay Thai boxing in Koh Phi Phi, monkeys opening and downing Coca Cola, a scary motorcycle taxi ride through Haad Rin at 4AM, and a terrifying ping pong show experience in Phuket (details too explicit to discuss). Overall, amazing. Also, if you're an avid yogi interested in similar yoga retreat-type trips, be sure to check out One Love Yoga. Such an amazing experience - hope on their next retreat to Nicaragua or Thailand! 21 comments on "One Love - Thailand"
Really gorgeous photos :) definitely makes me want to go there! Thanks so much Karen! You definitely have to make a trip out there - it's unreal! Great to see you enjoyed your trip! I was just in Phuket recently & had a great time, and we managed to survive a week of driving around on a scooter! totally know what you mean about photo overload! between my phone, camera & go-pro I managed to take over 500 photos in a singe week! Thank you so much! 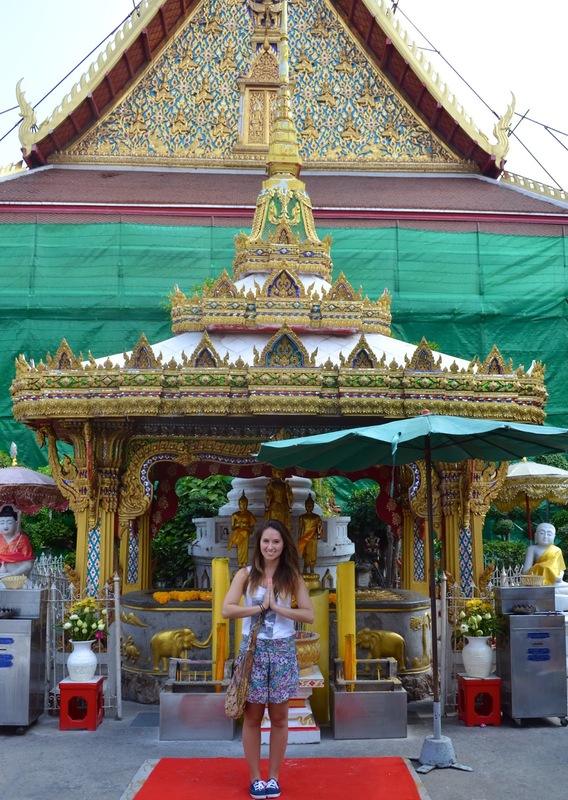 I loved all your photos from Phuket - what an incredible country, I cannot wait to go again. Oh gosh, these are amazing! Going to Thailand and riding an elephant (really) is on my bucket list! Your yoga pictures are insane! Woot, go girl! Loved living vicariously through your pics! Thanks Sig! I didn't even have time to visit the elephant sanctuary this trip :( :( which only means I have to go again asap! STOP IT. I am insanely envious of your life! Gorgeous pictures... take me with you next time?! I can probably-maybe fit in your suitcase. Haha I'll absolutely bring you with next time! Clothes are SO. CHEAP. and surprisingly really good quality! It's my personal heaven. Thanks Allie - it was incredible! I've read about some amazing yoga retreats in the U.S. too which I'm definitely going to look into. Wow, what an amazing trip!! PS I am checking out the Nicaragua retreat! And AMAZING, I heard Nicaragua is an incredible trip. Plus Reno and SJ are unbelievable yogi instructors, so inspired after 2 weeks with them!